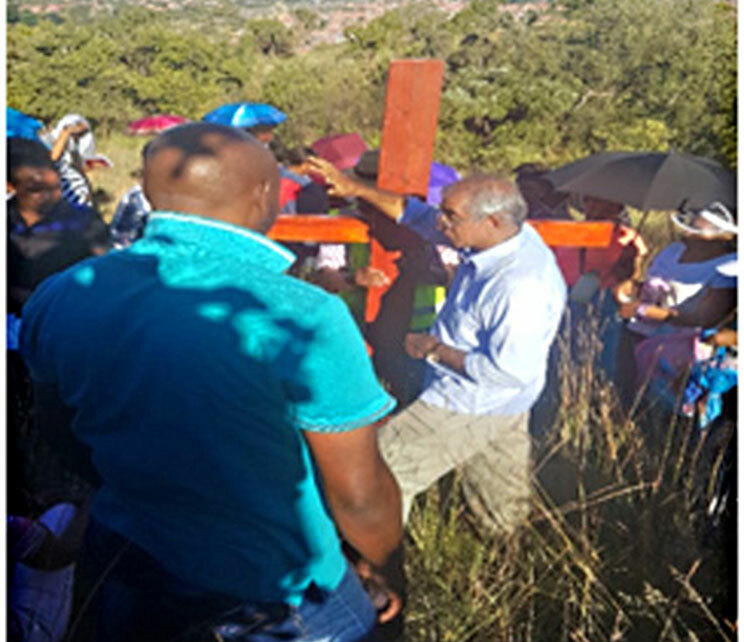 By Ezzy Seabelo – On the day before Palm Sunday, the community of St Peter’s church in Tlhabane, led by parish priest Fr Peter Ackappady, braved the boiling heat and walked for 6km from the church to the nearby mountain ridge on the road to Phokeng as part of an annual Easter pilgrimage. Initiated by Fr Ackappady in 2016, the numbers of people joining has grown over the three years from 60 to 115. The congregation carry their crosses from their homes and recite the Rosary along the way until the foot of the mountain. Then, going uphill, they begin with the 14 Stations of the Cross, pausing at each station, kneeling on the rocky stones, and praying. The day before Palm Sunday is chosen as an opportunity for the priest to prepare the congregation for Holy Week. The other objective is to educate parishioners on “salvation through suffering”, as Jesus suffered on his way to Calvary. St Peter’s parish is very proud of this experience offered by Fr Ackappady, and the many gifts it brings. The congregation believes Rustenburg diocese under Bishop Kevin Dowling is blessed to have such an inspiring priest. They encourage other parishes and dioceses to initiate similar pilgrimages. There’s no cost — all one needs is a cross and a rosary. Previous story Pope: The Devil is a Real Threat to Christian life, Not a Myth!